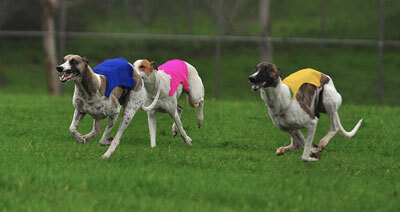 Amateur sighthound racing is fast-growing sport that aims to test the speed of dogs over a set distance. There are two types of amateur racing in North America: sprint racing and oval track racing. Sprint racing meets are sanctioned by the Large Gazehound Racing Association (LGRA). The track is a straight sprint of 200 yards, similar to drag racing for cars. Each meet consists of three programs with each dog running once per program in a group of as many as four dogs per heat. The dogs are released from a starting box or by hand. Oval track meets are sanctioned by the National Oval Track Racing Association (NOTRA). Oval tracks range in length from 270 yards to 440 yards depending on the size of the field. As with sprint racing, each meet consists of 3 programs and dogs are released from a starting box or by hand. 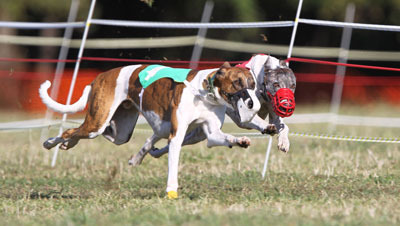 Lure coursing is a sport for sighthounds that is designed to simulate the coursing or hunting of live game. Magyar Agárs are eligible to compete in lure coursing trials sanctioned by the American Sighthound Field Association (ASFA), the National Lure Coursing Club (NLCC), and the United Kennel Club (UKC). Lure courses are constructed using a system of pulleys, a motor and a plastic bag as the lure. Courses range in distance from 500 to 1000 yards, and consist of long sprints as well as a series of turns. Dogs run in trios or braces (depending on the sanctioning organization) and are judged using either a category scoring format or a point tally scoring format. Coursing wild jackrabbits is an activity largely available only in the western United States, and is the precursor to most of the lure-based events. OFC meetings are conducted in a similar fashion to lure coursing trials. Dogs run in groups of up to three or four, and are judged on several categories including speed, agility, endurance and kills or takes. In order to flush out the game, dogs and owners must hike over miles and miles of rough and rugged terrain; sometimes spending several hours out in the field. Sometimes the jackrabbits are caught, but for the most part they live to run another day. Magyar Agárs are eligible to compete in events sanctioned by the National Open Field Coursing Association (NOFCA).